Fadi Salameh and his wife, Suheir, were buzzing with excitement. The young Palestinian couple were about to see their new, and almost finished, apartment for the first time. It was late 2014, and the opening phase of Rawabi, the first planned city in the Palestinian Territories, and the West Bank's biggest private investment – estimated at $1.2-billion (U.S.) – was nearing completion on a hilltop nine kilometres north of Ramallah, the effective Palestinian capital. "When we opened the door, I couldn't believe my eyes – this was going to be my house," Ms. Salameh says. "I recited the Koran immediately: May God bless this house and bring us all the good things and keep away all the bad things. Then I started to clean, because our furniture was coming the next day." Six-year-old Nour Salameh, right, joins neighbourhood friends in making good use of the communal play area. Rawabi, which means "hills" in Arabic, would not be just another row of cookie-cutter apartment blocks. It would be a proper metropolis, a city of sandy-golden stone on the mountain unlike anything else in the West Bank, maybe the entire Levant. It would be a planned community embracing the best elements of American, Italian and Arabic urban design, and contain enough housing for up to 40,000 Palestinians and Israeli Arabs. The streets would be narrow, to encourage walking; the densities would be high enough to bring life to the streets, but not so high that residents would find themselves immersed in a crush of humanity every time they stepped outdoors. Open squares would bring residents together to talk and shop, and indoor parking would ensure that the streets would not be clogged with cars. Public amenities would range from a Roman-style amphitheatre with 15,000 seats (the biggest of its kind in the Middle East) and cinemas, to playgrounds and a dazzling fibre-optic telecommunications system. The Salamehs, with legal possession of an apartment they couldn't inhabit, had to wait; they didn't spend their first night in their new home until Aug. 17, 2015. Rawabi's success is essential if Palestine is to develop a sense of self-confidence, both politically and economically, as it struggles to establish a sovereign state. If the city fills up, attracts investment and creates jobs, it will deliver the message to the world that the Palestinians can be competent stewards of their own affairs. It it fails – and it could well fail – Rawabi would emerge as a monument to Palestinian economic incompetence while providing more evidence that the Palestinians are fighting a losing battle with the Israelis for sovereignty in the West Bank. Originally from Nablus but educated in the United States, Bashar Masri is the lead developer behind Rawabi. Rawabi is a development designed to invigorate the moribund Palestinian economy and play a central role in the "battle of the hilltops" – the fight to prevent the last bits of prime West Bank real estate from turning into Israeli settlements. Mr. Masri, 55, is tall, slim, and typically wears elegant suits, though when I meet him he opts for a simple white shirt and jeans. He is from Nablus, the bustling Palestinian cultural and commercial centre in the northern end of the West Bank, and is the nephew of Munib al-Masri, the Palestinian billionaire, philanthropist and peace advocate who is variously known as "the Duke of Nablus" or simply "the Godfather." Mr. Masri speaks English flawlessly. The son of a doctor, he emigrated with his parents to the United States in 1977 and earned a chemical-engineering degree from Virginia Tech in 1983. Through marriage to an American, he holds U.S. citizenship. He worked as a consultant in Washington for a while, and in 1995 returned to Palestine where, backed by his wealthy extended family, he formed the Massar group of companies. Today, the group controls 30 businesses in real-estate development, agriculture, information technology, media and financial services. Massar had built affordable-housing projects in Morocco and, in 2007, Mr. Masri decided to up his game and plan a housing biggie in the West Bank, where the Palestinian population was burgeoning and high-quality residential construction was scarce. Rawabi would not just be a matter of urban design. Above all, it would have a technology centre to create jobs, so that residents could work and live there: Mr. Masri wanted to create a self-sustaining community, not just a Ramallah suburb. Tech's advantage? It would, in effect, be occupation-proof. "Unlike other industries, tech is an industry that can be transported over wires – it doesn't have to go through checkpoints," Mr. Masri says. The project launched in late 2007. In 2008, Mr. Masri's property arm, Bayti Real Estate Investment Co., valued it at $800-million. In the same year, Qatari Diar, the property arm of the fabulously wealthy Qatari sovereign wealth fund, put up two-thirds of the money for Rawabi (the Qataris and Toronto's Brookfield Property Partners jointly own London's Canary Wharf, Europe's biggest office development). The marketing campaign and construction on the first lot of 5,000 planned apartments, with a price range of $700 to $900 a square metre, began rolling, and prospective buyers eagerly pored over floor plans in the sales centre. The first families to move in – late last summer, after the water was finally connected – were thrilled. Mohammed Salem Almasti, who works in Rawabi's newly opened supermarket, and his wife say they love the views most, even if the walk-in closet is hard to beat. On a clear day, they can see Tel Aviv and the Mediterranean. "I never saw the sea until I came to Rawabi," he says, explaining that he has no permit to enter Israel – and thus no way to access the coast. Theirs has not been the typical experience. Today, the project is two years behind schedule, and costs have ballooned by at least $300-million. Only 700 apartments have been sold, and only 400 of those have been fully built and handed to their new owners. No tech company, beyond one of Mr. Masri's, has committed to opening an office in Rawabi. A view from Rawabi that shows the pipeline, right, that brings water to the community. At left is neighbouring Ateret, whose residents claim that, so far, their biggest concern is gridlock. "With no water, the project was going to go belly up," Mr. Masri says. Rawabi's developers and Israeli water officials spent several years, and held hundreds of meetings, trying to negotiate a water deal. The Rawabi side learned that it would have to go through the Israeli-Palestinian Joint Water Committee (JWC), a creation of the Oslo Accords, to obtain water supplies. But the Palestinian Authority (PA), the governing body of the autonomous Palestinian regions in the West Bank and Gaza, was mostly boycotting JWC meetings because the Israelis had effective veto power at the committee or simply bypassed it, says Shaddad Attili, the PLO minister who is the former head of the Palestinian Water Authority. "When they were building settlements, they didn't go to the JWC," he says. "The settlements always got water; we didn't." By the end of 2014, the water crisis had reached the point that 450 Rawabi apartment-purchase contracts were cancelled, Mr. Masri says. The Rawabi developers launched an international PR offensive, and that managed to secure sympathy from some world leaders, including former British prime minister Tony Blair. In February, 2015, shortly before Israeli Prime Minister Benjamin Netanyahu's address in Washington at a joint session of Congress, an unconditional water agreement – unconditional, in that Rawabi's water was not awarded in exchange for Palestinian-approved water connections to Israeli settlements – was miraculously approved by the Israelis. Baruch Nagar, the head of the Israeli Water Authority, blames the water-connection delay on infighting between the Palestinian Water Authority and Rawabi's developers. "The Israeli side presented two possible routes for the [water] pipeline to Rawabi," he wrote in an e-mail to The Globe and Mail. "The Palestinians have been asked to choose and plan one of them. Until now, they didn't do it." In published interviews, he also variously explained that the water requests were turned down because of Rawabi's "deficient" sewage-treatment plan and because the Palestinians, by refusing to allow the JWC to approve "emergency" water supplies to Israeli settlements, were violating the Oslo water articles. Rawabi's water finally started to flow though its new pipeline last May. But there's only enough for about 5,000 residents – maybe one-eighth of the total it will eventually need if the city is fully built. The water battle will continue. The hilltop statue created by Palestinian artist Nabil Anani depicts a family standing hand in hand. Their backs are turned to Rawabi’s next-door neighbours, the Israelis living one hilltop away in Ateret, which was among the first settlements – considered illegal under international law – built after Israel’s defeat of Arab forces in the Six Day War of 1967. As construction proceeds, the Palestinian economy has gone from weak to dire, and the body count among Palestinians and Israelis is climbing in the "knife intifada," which began last September and continues its bloody course today. The heightened security at the Israeli checkpoints in the West Bank has restricted trade and raised fears among potential house buyers that Rawabi could become entirely isolated if the violence escalates. And the Palestinian Authority hindered Rawabi's progress as much as the Israelis have, Mr. Masri and his colleagues claim. It wasn't just a question of failing to participate in water negotiations – there was a broader lack of support. "Not one shekel from the PA has come to us," says Amir Dajani, Mr. Masri's top Rawabi development lieutenant. "Rawabi is a good design, but it's coming slightly before its time," says Sam Bahour, an Ohio-born Palestinian who runs an independent consulting firm in Ramallah called Applied Information Management and has developed some commercial properties in the West Bank. "That's why I see it as bold. The PA doesn't really have the planning capacity to support the private sector, and it's not really affordable housing. It's a bad time for this project to come to market." Mr. Masri acknowledges that Rawabi has not gone to plan and that there is virtually no hope that the ambitious project will be profitable, all the more so since the Qataris, the project's main financial backers, are balking at funnelling more money into a project that has gone vastly overbudget. Rawabi's failure is not out of the question. If it does come tumbling down from the mountaintop, the damage would not be limited to Rawabi's private investors. The whole Palestinian economy would suffer. "We need more Rawabis," Mr. Masri told me from the city's slick sales centre, complete with a 3-D cinema, on the hill overlooking both Rawabi and the Israeli settlement of Ateret. "The Israeli occupation has suffocated the economy, and the domino effect – Rawabi 1, 2, 3, 4 – will not happen if this Rawabi is not a success." Suheir Salameh with the children at the new condo in Rawabi. We are piled into the living room of Fadi Salameh's family home in Biddya, a dying Palestinian mountain town – population about 8,000 – about 30 kilometres north of Ramallah, on the western edge of the West Bank. Mr. Salameh's mother, Afaf, serves us tea and ka'ak, a soft bread in the shape of a ring covered with sesame seeds. We tear off chunks and dip them in olive oil and thyme. Historically, Biddya's prolific olive-oil and olive-soap production, along with a small steel plant and shopping trips by Israeli settlers, kept its economy alive. But after the sustained violence of the second intifada, in the first half of the last decade, the economy collapsed. Most of Biddya's young men are unemployed, and when they see Israelis they see soldiers, not shoppers. But Biddya served a purpose for Fadi, who is now 31, and Suheir, 30. It allowed them to live rent-free while they salted away shekels (Israel's currency is used throughout the West Bank) for their dream apartment in Rawabi, where they would raise their children. The couple invited me to Biddya, to see how they lived before they finally made the big move last August. Suheir Salameh is shown at the home of her husband’s parents in the village of Biddya. The former is a ramshackle affair on a dusty side street. The facade of the house, built by Fadi's father, Yacoub, in the mid-1970s, is unremarkable and rather oppressive – small windows, sand-coloured stone tiles over a concrete frame. The back overlooks a messy expanse of cracked concrete; a garden where sage, scallions and a lemon tree grow; and the remains of a shed that was once home to the late "Fatty," the family's donkey. Mr. Salameh, his five brothers and two sisters grew up in this impossibly crowded, two-bedroom house. His father was a house painter. They ploughed nearby plots of farmland, went to school and, occasionally, mobilized to fight Israeli settlers. Mr. Salameh studied Islamic law at the West Bank's An-Najah National University and eventually found a job as a teacher in Ramallah. He met Suheir, who now teaches gymnastics at a high school near Biddya, at university; they married in 2009. The newlyweds were broke and, before they knew it, living in Fadi's parents' basement. It was unpleasant. A former garage and storage room, it had no windows – they would slide open the garage door to get natural light – and the walls were painted a garish green and pink. Two of their children were born while they lived here. They spent most of their waking hours upstairs in the old family home while they plotted their escape. They had heard of a fantastic new city under construction. "Then my sister got a job as an engineer at Rawabi and she introduced me to the city," Mr. Salameh says. "We saw the houses and loved them. They were new, they were fresh and they smelled great." Afaf was distraught when her son and his family finally loaded up their Ford and moved. "In our tradition, it's usually the daughter who moves away, not the son," she says. "I am not happy he has gone, but we Skype every day." To Mr. Salameh, the Rawabi apartment, with its Western-style kitchen, parking garage, high-speed Internet connection and filtered, potable water, represented more than comfortable living. It was also a break from stifling tradition. "In Rawabi, you rub shoulders with all sectors of Palestinian life," he says. "It's a melting pot. Here in Biddya, you deal with your brothers, your cousins. There is nothing new." Rawabi had still another appeal: Buying was an act of defiance. "Rawabi is a hilltop and as long as we are living on the hilltops, we are resisting," Fadi says. "The Israelis have taken most of the hilltops. For us, it's retrieving what little is left for us." Fadi Salameh loads his son Yacoub, 4, and daughter Nour into the car for the trek for school. Rawabi, he says, was not conceived as a political statement by the Palestinians; nor was it an act of contrition; nor was it a peace gesture by the Israelis, who, through their control of the water, electricity and roads into the ostensibly autonomous Palestinian areas of the West Bank, effectively allowed the city to be built. Instead, he says, it was a simple, bilateral business deal. "It's mostly a relationship between Israeli and Palestinian businesses," he says. "There is Israeli profiteering in Rawabi." Therein lies one of Rawabi's greatest problems – the only way the Palestinians could build it is by working with the Israelis. Mr. Masri's awkward publicity manoeuvre saw him promote Rawabi as an act of defiance against the occupation, even as he formed alliances with the occupiers. Mr. Masri admits that much of the material for Rawabi's construction comes from Israel, but says that buying Israeli products and services was a matter of necessity. He would have loved to purchase all the materials from Jordan, but importing them would have posed grave risks to the construction schedule. Israeli-approved permits would have had to be issued and Israeli military checkpoints could have held up trucks for hours or days. "It's not just Rawabi," he says. "Every Palestinian in the West Bank buys Israeli products because they have to. All the electricity from the West Bank comes from Israel." Still, there is little doubt that Rawabi's Israeli connections have repelled some potential buyers. The Electronic Intifada, the popular news website that focuses on the Palestinian Territories, has criticized Mr. Masri for using Israeli suppliers. The Palestinian Boycott, Divestment and Sanctions National Committee, which advocates a global boycott of Israel unless it complies with international law in the West Bank, has condemned him for attending Israeli technology conferences to attract Israeli companies to set up shop in Rawabi. The committee calls his attendance a "shameless act of normalization" with the Israelis. Reem Bahdi, an associate professor at the University of Windsor's law school, and visiting professor at Birzeit University's graduate program in democracy and human rights in the West Bank, agrees that Rawabi has an image problem. "There is a sense that the project does not represent Palestinian prosperity or self-determination as it was supposed to do," she says. "Instead, it progresses, or not, by Israeli permission. It's a reminder of the continued colonial condition over Palestinian lives." Rawabi's developers have a vested interest in being somewhat less cynical. They insist that the PA simply lacks the financial heft to throw its full support behind Rawabi and is not culturally attuned to large-scale commercial development. The PA lives or dies on the flow of donor money, spends about a third of its budget on its security forces, and seems particularly weak at the moment. Mr. Bashar and his development officials say the PA agreed in 2008 to finance about $140-million in public infrastructure for Rawabi – essentials such as roads, a police station and a medical centre – and has come up with nothing. "The PA is not against this project," Mr. Bashar says. "They're just not gung-ho about job creation." A Palestinian construction worker in Rawabi. The Israeli settlement of Ateret lies one small valley away from Rawabi. The two towns are in plain site of each other, though Rawabi is somewhat higher. As if to advertise its territorial claims, the Ateret hilltop is dotted with Israeli flags; ditto Rawabi's height of land, with Palestinian flags, one the size of a living-room floor. Ateret was one of the first Israeli settlements – considered illegal under international law – built in the West Bank after Israel's crushing defeat of the Arab forces in the Six Day War in 1967. Today, it is home to about 100 families. They have few amenities beyond a small supermarket, a playground and a basketball court. I asked several Ateret residents how they felt living, almost literally, in the shadow of Rawabi. One settler, who declined to give his name, said he didn't have a big problem with it. "Personally, it does not make me angry, though it makes me a little bothered that they take up the beautiful view," he says. Another settler, Simcha Shumacher, 33, the CEO of a small Israeli branding and design company and a father of six, says he fears the roads around Ateret and Rawabi, already inadequate, will get absolutely plugged once Rawabi fills up. Who would pay for the roads, I ask. "This is Israel's property," he says without hesitation. "Israel has to fix it." By design or accident, Ateret is playing an expanding role in the battle of the hilltops. As Rawabi gets bigger, so does Ateret; another 50 homes are soon to be built. When Rawabi's few residents see Ateret, they are always aware that the occupation is intact and intensifying. At the top of the hill overlooking Rawabi, Mr. Masri has placed life-size metal sculptures of a Palestinian family of six, holding hands in a line, on one side of a soaring flagpole. Their backs are to Ateret. This is no accident. "This city has to succeed," Fadi says. "It's rare to see Palestinians taking over a hilltop. We are resisting." Eric Reguly is The Globe and Mail's European bureau chief. 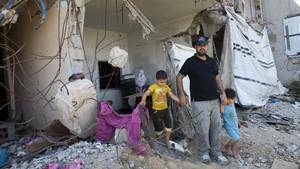 At the gates of Gaza: Two vantage points of the Israeli-Palestinian divide On the anniversary of the Israeli-Gaza war, The Globe's Patrick Martin visited families in two communities on opposite ends of the conflict to see how the frontier, history and their fears still divided them. A toddler’s death and the cycle of revenge On July 31, 2015, 18-month-old Ali Saad-Dawabsheh’s death in an arson attack in the West Bank – believed to have been carried out by Jewish extremists – galvanized the world’s attention. Five months later, Patrick Martin found no one had been charged and tensions between Israelis and Palestinians were as bad as ever.